Power BI Matrix also called as Cross tab is useful to display the relationships between two, or more than two groups. In this article we will show you, How to Create a Matrix in Power BI with example. 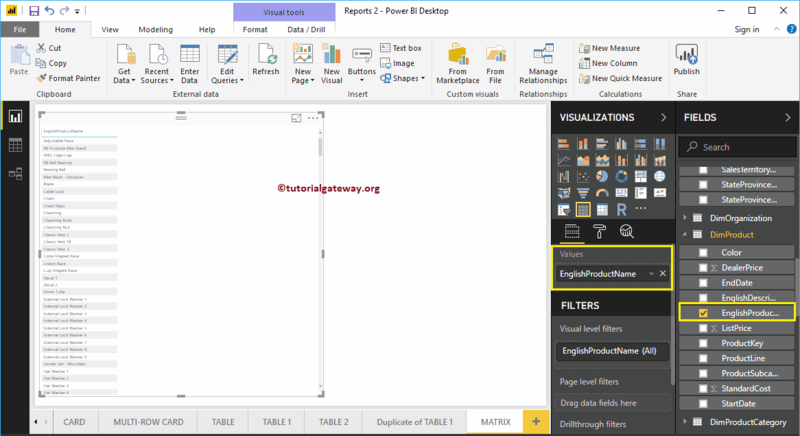 For this Power BI Matrix demonstration we are going to use the SQL Data Source that we created in our previous article. So, Please refer Connect Power BI to SQL Server article to understand the Data Source. 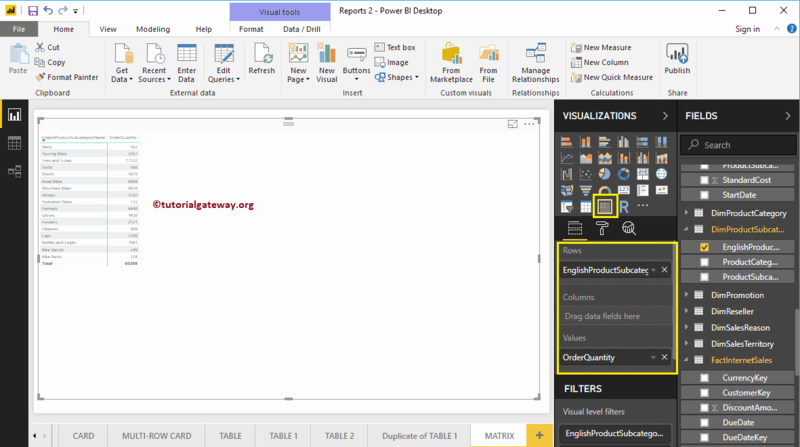 When you drag any dimension field to the Canvas, Power BI will automatically create a table. Let me drag and drop the English Product Name from Fields section to Canvas. And you can see the table. Next, let me drag one metric value (Sales Amount) to the Values section and click on the Matrix under the Visualization section. Clicking the Matrix will automatically convert a Table into a Matrix. 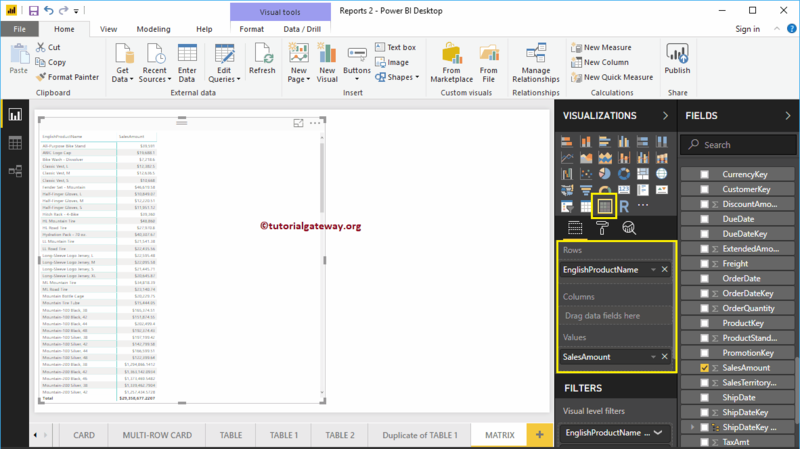 From the below screenshot, you can see the Matrix representation of English Product names, and Sales Amount. 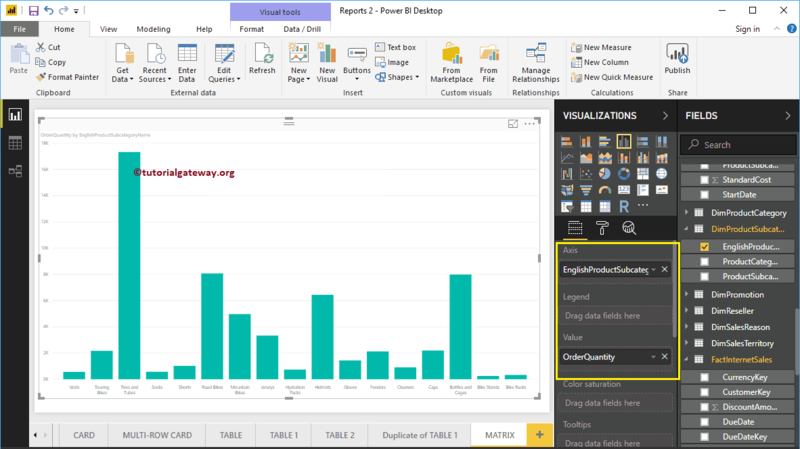 If you want to convert existing chart into Power BI Matrix then you can follow this step. 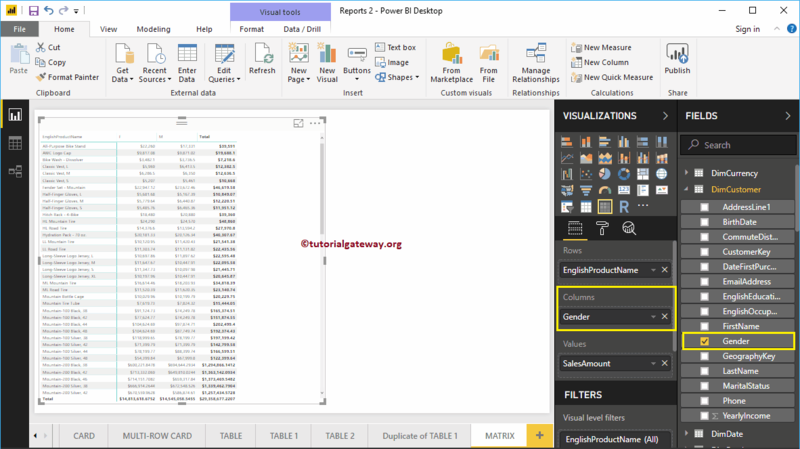 As you can see from the below screenshot, we created a column chart, which represent the Order Quantity by English Product Subcategory. 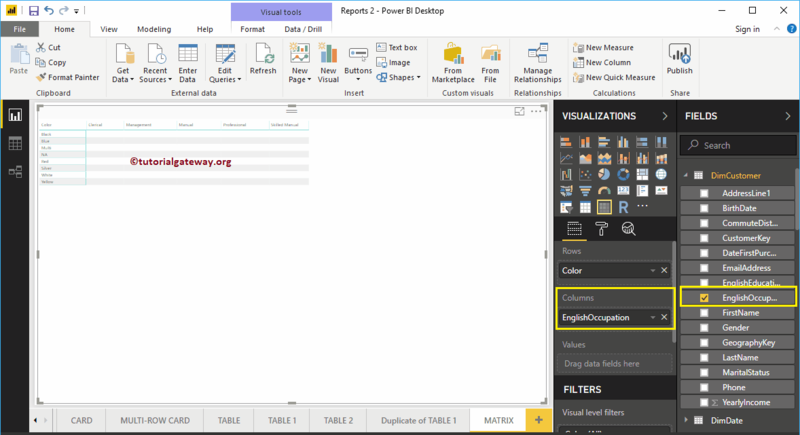 Click on the Matrix under the Visualization section will automatically convert the Column Chart into a Matrix. First, click on the Matrix present in the Visualization section. This will automatically create a Matrix with dummy data. 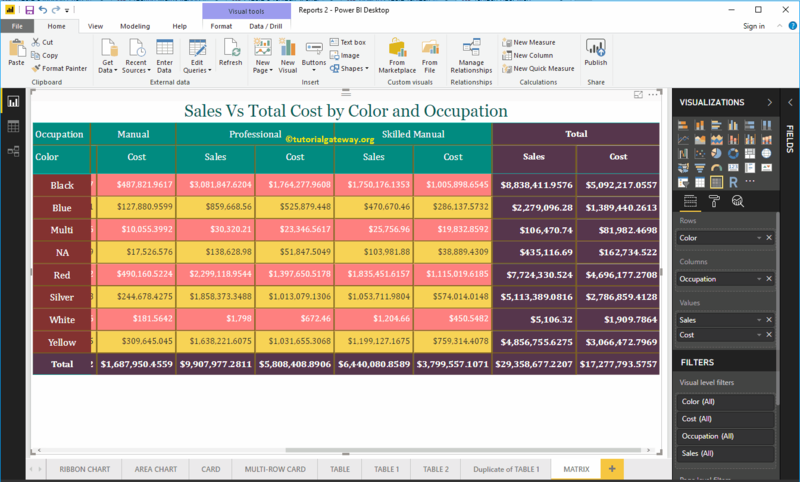 Next, let me add the product Color as the Row Group. 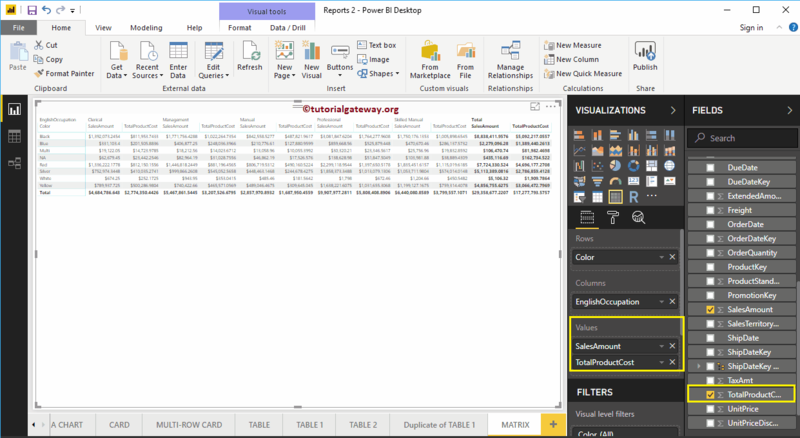 For this Power BI Matrix demonstration purpose, we are adding one more metric field i.e., Total Product Cost to the Values section. NOTE: I suggest you to refer Format a Matrix article to understand the formatting options.